Spring Flowers, or is it Showers? Well, depending on where you live, spring showers don’t bring flowers, they bring freshet (rapid snowpack melt and overwhelmed stream channels) and sometimes flooding. Since rising water can also impact the flow of traffic, we often have a role in flood management by managing and maintaining the provincial highway system. Whatever the water level, we have people on the job to get you where you need to go. The ministry activates flood plans, manages situations to minimize disruption, communicates with the public and provides critical services during flood events, such as protecting and repairing the road infrastructure and looking for creative options to move supplies. We also arrange for equipment, materials and contracted labour to assist with flood prevention and repairs to highway infrastructure. For example, in 2010, we raised the English Bridge North of Merritt to meet 200 year flood levels with the construction of a 22 metre precast concrete girder bridge. 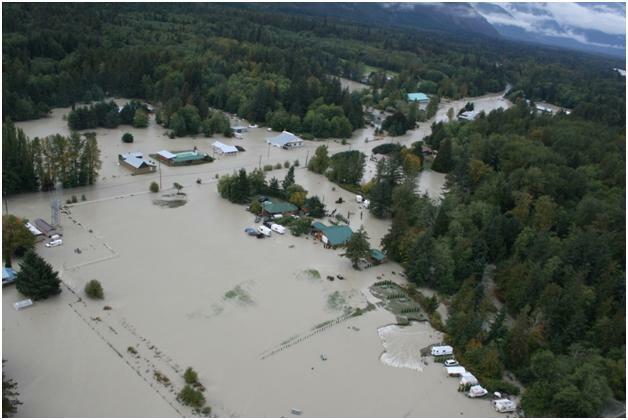 We generally have a good idea of the potential for flooding across B.C. because The River Forecast Centre monitors snow levels and provides us with data which we can use to help determine those areas of impact. For example, reports show snowpacks are quite high right now and while short term forecasts are good for minimal flooding, we are monitoring and ready for the large amounts of snow still waiting to melt. This type of knowledge helps our crews begin protective works or repairs, such as determining the amount of sand, gravel and rock needed to protect our transportation infrastructure from flooding, which helps keep roads open and available. In addition to supplies, we check with local ministry staff, maintenance contractors and emergency services to be certain everyone is ready to jump into action for any number of events if water levels get too high. Recently, we have been on the scene of a washout on Highway 33, about 22 kilometres east of Kelowna, and a mudslide on Highway 3A, near Keremeos. Higher than average snowpacks have increased the risks of flooding, washouts and slides from the freshet. Crews are working hard to repair roads at these locations while making sure traffic flow is maintained as efficiently and safely as possible. Drive BC has amazing BC HighwayCamswhere you can view highway conditions, traffic and weather information at a glance. So now that spring flowers have begun to bloom, give yourself peace of mind in rain or shine. Start by adding emergency preparation to your spring cleaning list and you’ll know which “road” to take to find higher and drier ground. It would probably help if your maintenance contractors cleaned out culverts when they are partially blocked with debris and vegetation instead of waiting for them to be fully blocked. Yes I have seen many partly blocked culverts.